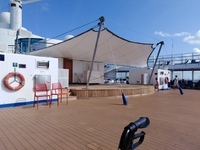 We had read previous reviews and we must have been cruising on a different ship as the ship was beautiful spotless good furnishings and fabrics and the public toilets were kept spotless.The itinerary was 27 nights from Italy to Mauritius ports included Crete Suez Canal Jordan Israel Maldives Seychelles Reunion Island.We could not call at Oman due to a Cyclone so much value for money on this cruise even with gratuities and drinks package we paid half for a four week cruise compared to a two week cruise on other companies. All the staff spoke english and were very friendly. The food was very good five courses every evening in the main dining rooms so much choice and of a good quality . Water was available free all day in the buffet restaurant until about nine in the evening .You only had to pay for water lunch and evenings in the main restaurants.Our cabin was kept spotless as was all the ship cleaning was done 24 hours a day. There was so much to do during the day and every evening there was a show. The entertainment team were a credit to the company especially Marco and the rest of the team. The english speaking guests had their own dedicated english speaking customer service advisor as did french german and spanish speaking guests. The daily information newspaper was printed in English and other languages. 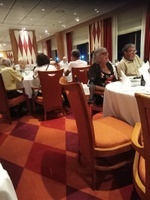 The cruise was magical and we have no hesitation in recommending Costa and Costa Victoria this was one of our bucket list cruises we travelled a quarter of the world and received so much value for the price we paid. 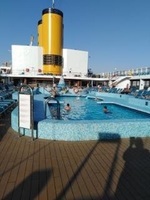 We will be looking forward to booking another cruise with Costa for next year. We had read previous reviews and we must have been cruising on a different ship as the ship was beautiful spotless good furnishings and fabrics and the public toilets were kept spotless.The itinerary was 27 nights from Italy to Mauritius ports included Crete Suez Canal Jordan Israel Maldives Seychelles Reunion Island.We could not call at Oman due to a Cyclone so much value for money on this cruise even with gratuities and drinks package we paid half for a four week cruise compared to a two week cruise on other companies. All the staff spoke english and were very friendly. 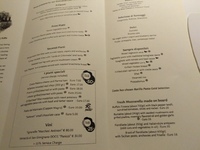 The food was very good five courses every evening in the main dining rooms so much choice and of a good quality . Water was available free all day in the buffet restaurant until about nine in the evening .You only had to pay for water lunch and evenings in the main restaurants.Our cabin was kept spotless as was all the ship cleaning was done 24 hours a day. There was so much to do during the day and every evening there was a show. The entertainment team were a credit to the company especially Marco and the rest of the team. The english speaking guests had their own dedicated english speaking customer service advisor as did french german and spanish speaking guests. The daily information newspaper was printed in English and other languages. 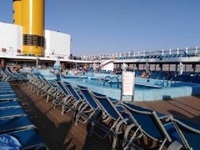 The cruise was magical and we have no hesitation in recommending Costa and Costa Victoria this was one of our bucket list cruises we travelled a quarter of the world and received so much value for the price we paid. We will be looking forward to booking another cruise with Costa for next year. 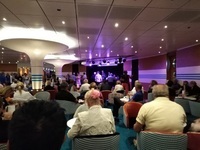 We have previously cruised with Royal Caribbean NCL Carnival and Princess and can honestly say Costa Victoria compared to the others was the best value for money. The crew were very helpful and at the medical centre I was able to have an INR test done and was offered a free telephone call to my hospital in the UK. My husband and I have mobility issues and departing the ship in Port we were shown to and able to go down a separate flat ramp (no steps). By the pool there were sunbeds reserved for disabled guests and in the main buffet restaurants tables were also reserved . On an evening in the theatre seats were also reserved at the back for disabled guests. 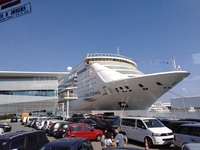 The ship was a perfect size for us not too large and had everything we were looking for a clean comfortable cabin good food with plenty of variety plenty of entertainment day and night excellent english speaking staff excellent ports of call and so many memories to cherish.